The controversial event was held during the Siberian Power Show, a popular sports show held in Krasnoyarsk on March 16 and 17. 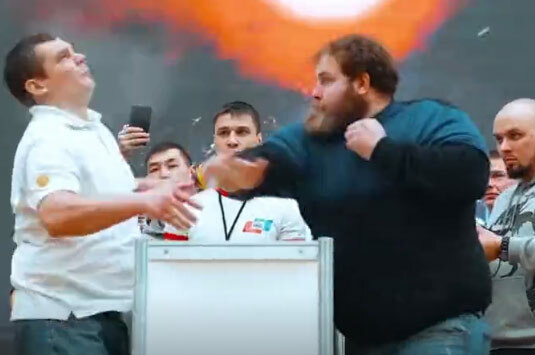 A similar competition took place last year, in Moscow, but it featured only professional athletes competing for the unofficial title of most heavy-handed face slapper. In this amateur face-slapping championship, competitors faced each other across a small table similar to the ones used in arm-wrestling competitions, and hit each other across the face with the palm of their hands. Ideally, one of the two men would be knocked out by the slap, but if both were left standing after taking three slaps, a judge would decide the winner based on power and technique. Although face-slapping isn’t an official sport (yet), the competition did have some simple rules. Participants were not allowed to hit opponents with the bottom part of their palm, only with the fingers and the upper half of the palm, to avoid causing serious injuries. They were also forbidden from targeting opponents’ temples, ears and eyes. These measures were meant to protect competitors, but when you’re an average-weight man getting slapped by a 350-pound heavy-handed farmer, they don’t really help much. Kamotsky easily won the face-slapping contest, and while he only got 30,000 rubles ($470) as a prize, he also became an overnight sensation after videos of the competition went viral online. Organizers have already invited him to take part in another face-slapping contest, this time against professional athletes, who they hope will prove a stiffer competition.